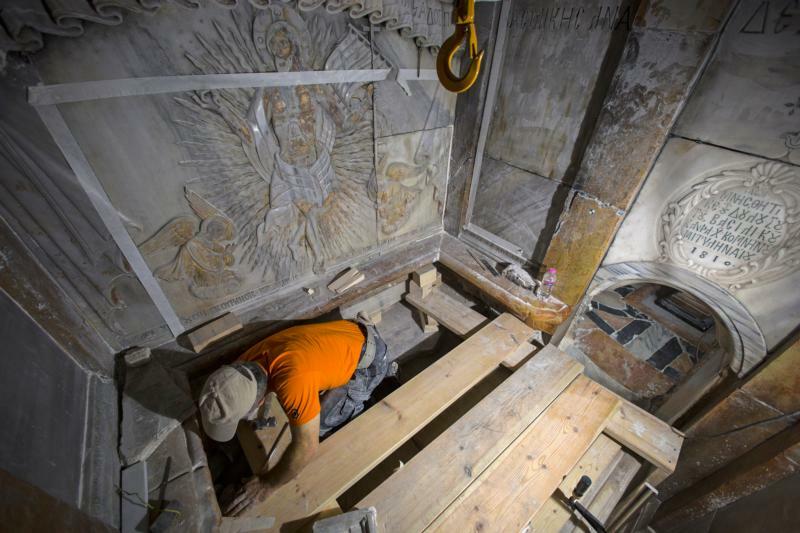 WASHINGTON (CNS) — Scientists who helped restore a shrine above the site believed to be the place where Christ was buried say testing of samples has dated the tomb to at least the fourth century. The new information published recently by National Geographic is consistent with historical accounts that say Constantine, the first Roman emperor to stop persecuting Christians and who became one, began protecting the tomb around the year 326. In the fourth century, Constantine is said to have sent a team from Rome to the Holy Land in search of the site, and after the group believed they had located it, they tore down a pagan temple on top of it and protected the tomb. Over the centuries, the structures above the tomb have been the victims of natural and human attacks. At some point, a marble slab was placed on top of the tomb, perhaps to prevent eager pilgrims from taking home pieces of it. In October 2016, when a team from the National Technical University of Athens was commissioned to restore the shrine around the tomb, which was in danger of collapsing, they also placed a moisture barrier to protect the tomb. It likely hadn’t been opened in centuries, but the opportunity allowed the team to take samples. “Mortar sampled from between the original limestone surface of the tomb and a marble slab that covers it has been dated to around A.D. 345,” said National Geographic in a Nov. 28 news story. Until the results were revealed to National Geographic in late November by scientist and professor Antonia Moropoulou, who directed the restoration project, there was no scientific evidence to support that the tomb was older than 1,000 years, the story says. What’s harder to pin down scientifically is evidence to prove that the person who was placed on the tomb’s limestone rock shelf and buried there was Jesus of Nazareth. However, a documentary set to air Dec. 3 on National Geographic’s cable channel shows interviews with scholars who say oral history strongly supports the possibility that the location of the shrine is the place where Jesus is believed to have been buried, a place where Christians believe he returned to life. “Why would people remember for several generations that this is the spot?” asked National Geographic archaeologist-in-residence Fred Hiebert in a Nov. 9 interview with Catholic News Service. In the absence of scientific data, you have to take into account people’s traditions, village traditions, that pointed to the site, 300 or so years after the actual event of Christ’s crucifixion, as the place where many believe he was buried, Hiebert said. “In the television documentary, you will see a very good case for the historical accuracy of [the site] because we know from the scientific data that this is the same spot, the exact same spot, where the Emperor Constantine said, ‘X marks the spot,'” Hiebert said, meaning that’s where Christ was buried. If you are a student of oral history and anthropology, it makes sense, said Hiebert, and it makes sense from a scholarly point of view. But Hiebert, who witnessed the restoration of the shrine from 2016-2017 and was present for the opening of the tomb, said he remembered what a Greek church official said to him when he asked a question about the likelihood of the site’s accuracy as Christ’s tomb: Each person has to make the decision about what to believe. “From an archaeological point of view, from a historical point of view, I can promise you that I can document that was pretty much the place that was identified in the fourth century A.D. [as the tomb of Christ], and for me that’s as much personal satisfaction as I need,” he said.